LIGO -the Laser Interferometer Gravitational wave Observatory is the first large-scale facility built to search and detect gravitational waves from astrophysical sources such as binary neutron stars, supernovae, or the Big Bang itself. The Observatory is funded by the NSF and is operated jointly by Caltech and MIT. LIGO consists of two detectors located at Hanford, WA and Livingston, LA, each arranged in a 4-km Michelson interferometer with Fabry-Perot resonators in the arms. The Physics Department at UTRGV is one of the largest groups in the LIGO Scientific Collaboration (LSC ). The faculty at UTRGV have a long history of participation in research at the LIGO detector sites. At UTRGV, we continue this research focusing in the following directions. LIGO premodecleaner optical cavities: These are three-mirror cavities or triangular ring resonators. The premodecleaners are part of Input Optics of the LIGO detectors designed to filter the laser beam (enrich its 00-mode content) and stabilize it against the pointing fluctuations. 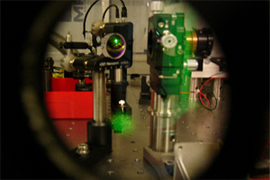 We have built several such ring resonators and performed experiments to characterize their optical performance. LIGO Electro-Optic Modulators: The UTRGV built electro-optic modulators (EOM) with RTP for LIGO detectors which generate three modulation frequencies at once. These EOMs are necessary for creation of the error signals to control the length and the angular degrees of freedom of the LIGO optical cavities. The difficulty in their design comes from the fact that these EOMs must operate with reliably with high power (200W) laser beam of the LIGO detectors. Suspension noise studies: We are conducing experimental studies of particular noise source in the LIGO suspension system called creep which is caused by a sudden mechanical micro release of their internal stresses. At UTRGV we built a system for direct detection of creep at high sensitivity. Such system is based on capacitive sensors, which are used to measure any displacement either linear or rotational using capacitive sensors which are based on the dependence of the electrical capacitance of a conductor on the distance from a dielectric body. We want is to detect the presence of creep in the bonding used in the LIGO test-mass suspensions. Frequency-doubling and high-power laser experiments: High conversion efficiency and high damage threshold is always desirable in frequency-doubling experiments. At UTRGV we investigate several materials for frequency doubling of the 1064nm wavelength with Nd:YAG laser radiation powers as high as 10 W. We also conduct studies with high-power Nd:YAG lasers using the Master Oscillator Power Amplifier design. The plans are to reach steady CW powers with single-frequency single-mode laser beam in excess of 20 W.
Laser Frequency Stabilization on an Atomic Transition Line: Atomic transitions provide a natural reference for the laser frequency and can be used in laser frequency stabilization experiments. 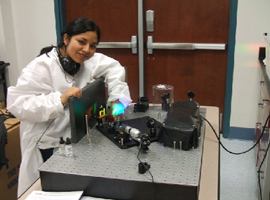 One such experiment is conducted at the Optics Lab at UTRGV. The hardware for this experiment was received from the NASA Goddard Center. 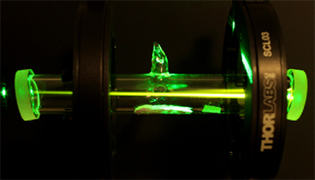 In this experiment, the fundamental mode of a Nd:YAG Laser is frequency-doubled laser by a nonlinear crystal which is then locked to a hyperfine transition line of Iodine atoms using the Doppler-free saturation spectroscopy. This experiment continues the research started at Goddard studying feasibility of the laser frequency stabilization methods for space applications. Laser Frequency Stabilization with External Cavity: Today many branches of science and technology require lasers with narrow line width and high stability in both laser frequency and intensity. 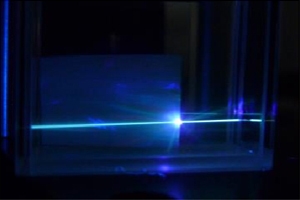 Particularly interesting are applications of stable lasers for space research. At UTRGV we developed an experimental program to study techniques for laser frequency stabilization which can be suitable for being placed on a satellite launched into space. The experiments are pushing the limits of what is currently available and require ultra-stable optical cavities and superior thermal isolation using multi-stage radiation shield inside a vacuum chamber. The controls are based on the Pound-Drever-Hall technique and employ several feedback control systems working at their respective frequency bands. Nanophotonics is an exciting new area of research which effectively combines techniques from several branches of science, including physics, engineering, and computer science. Nanophotonics deals with interaction of light with matter at the nano and micro scale. It includes photonics crystals, waveguides, resonators, integrated photonic circuits, new optical materials and devices. At UTRGV we conduct research in several areas of nanophotonics. Optical Properties of Synthetic Opals: Synthetic opals are made of close-packed mono-disperse silica nano spheres. Their close packing is achieved with self-assembly techniques and can lead to relatively large volumes of roughly uniform domains of face-centered cubic lattice. If the lattice spacing defined by the diameter of the nano spheres is comparable to the wavelength of the visible light, the opals become 3-dimensional photonic crystals with interesting optical properties. Numerical simulations have shown that this type of material can have partial photonic band gaps for certain directions of the light propagation. We study the optical properties of silica opals, their transmission and reflection spectra, and their wide-angle diffraction. The opal samples for our experiments are fabricated at the MacDiarmid Nanotech Institute of UT Dallas. Silicon Nano-patterned membrane reflectors: These are 2-dimensional photonic-crystal slabs. They hold many promising applications in photonic integrated circuits and can be used as ultra-compact mirrors with controlled spectral response. Built entirely from dielectric materials, such membrane reflectors can have very low losses and therefore can deliver near-100% reflectivity both in narrow and wide-band configurations. At UTRGV we study the reflectivity of these devices and their wide-angle diffraction field which originates from the lattice structure of the sub-wavelength scale on the reflector. A Nuclear Science Research Facility has been established at UTRGV comprising 100 microgram Californium-252 neutron source and High Purity Germanium Detector (HPGE) with gamma ray spectrometer and gamma vision software. This equipment enhances students knowledge in Nuclear Science and Engineering through the processes of Neutron Activation Analysis (NAA) and neutron flux characterization. The facility is located at the Academic Support Facilities Complex in ASFC 1.312 A. Concentration levels have been determined of radio nuclides in soil samples from a chemical plant in the Rio Grande Valley, TX using neutron activation technique. This chemical plant has been closed for years but people living nearby have been complaining of many infectious diseases. The results were presented at the annual nuclear conference in 2006. 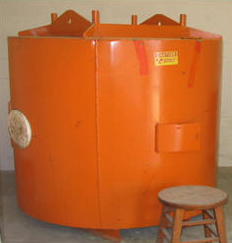 The UTRGV Californium facility has also been used to determine mercury levels in fish samples consumed mostly by the Rio Grande Valley people to verify whether this heavy metal has carcinogenic level. The mercury was determined in detection limits which did not give information about its carcinogenic effect. NAA is not a suitable method to determine mercury in sample and the UTRGV Californium source strength is low to identify this metal. The result was presented at the HESTEC annual meeting. Dr. Hannan was working in collaboration with the Hidalgo county WIC Center (Norma Longoria) in Edinburg , Dr. Bob Faraji and R.C.Rodriguez (student) from the Dietetics department measured concentration levels in zinc, iron, selenium, and iodine in samples of mothers milk using Neutron Activation method and Atomic Absorption technique. The objective was to identify whether these heavy elements are within the Recommended Dietary Allowance (RDA) intake values as specified by the American Academy of Pediatrics. The results were published in the peer reviewed journal in 2009. Dr. Hannan is currently measuring thermal neutron flux of this facility by loading the Californium source into the UT Austin shielding cascade (4 ft diameter X 5 ft height) donated by the UT Austin Nuclear Engineering Teaching laboratory (NETL). Water extended Polyester (WEP) is used as a moderator (Moderator thermalizes fast neutrons into thermal neutrons). The thermal flux at a distance of ~ 20 cm was determined as 2.2 x 104 n/cm2 s-1. The measured reaction rate determined by different neutron activation foils will be used to unfold the UTRGV Californium neutron flux spectrum using the MAXED unfolding program. The UTRGV Californium facility, the gamma counting system, and spectrum analysis are shown in the figures below. Figure 1 - 100 microgram Californium 252 neutron source facility. 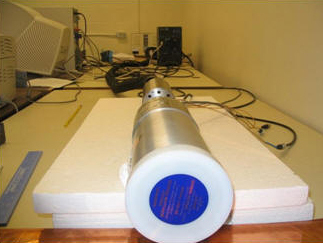 Figure 2 - HPGe Gamma Detector at the Nuclear Research Laboratory for neutron activation analysis and neutron flux characterization to enhance students knowledge in Nuclear Science and Engineering. The faculty involved in these research areas are: Dr. Mario Diaz, Dr. Volker Quetschke, Dr. Malik Rakhmanov, and Dr. Ahmed Touhami.